With the New Year starting, I’m reading a lot about how I should be making revolutions of things I’m gonna do in 2015. I’m here to tell you it’s rather hard—if not impossible—to mess with perfection. I don’t need to change in any way. My peeps, however, do; so every year I make revolutions for them. Most years they don’t take my revolutions seriously so I have to bite some sense into them. 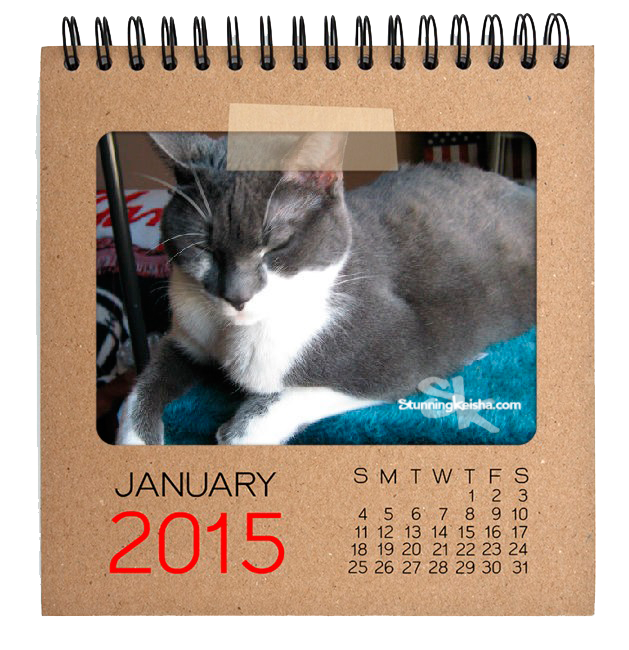 Here are my list of my demands revolutions for the peeps and also a CK January 2015 Calendar. I want more playtime with both TW and Pop. Pop got that new Hovercraft DRONE that we’ve been playing with together. TW gave it to us both for Christmas. I hope he’ll continue to entertain me with it. I want more time to visit my blogging furrends and comment on their blogs. TW is to provide a new blog everyday for me. The peeps will order Chinese food at least once a week and get that chicken on a stick. TW is to start meditating so she’s not wound so tightly. She needs to chillax cos she claims I’m gonna give her a stroke or heart attack someday. TW will NOT lock me out of her bedroom—EVER! No more gut rot. I only want the expensive food in addition to my Fancy Feast tuna. Brands I will accept: Weruva, Merrick, Wellness. Treats I will accept: Greenies SmartBites, Wellness Kittles and Temptations. Kibble I will accept: Wellness, Rachel Ray Nutrish, Taste of the Wild. I would like to be FURminated at least three (3) times per week. Pop will stop being clumsy. TW MUST stop calling me a senior cat but I can continue to hashtag comments about her with #senile. My demands revolutions will be met—or else my teeth will be busy! I’ll gonna repeat one of my favorite comics which describes how I feel about New Year’s Revolutions. Did you get suckered into making revolutions? 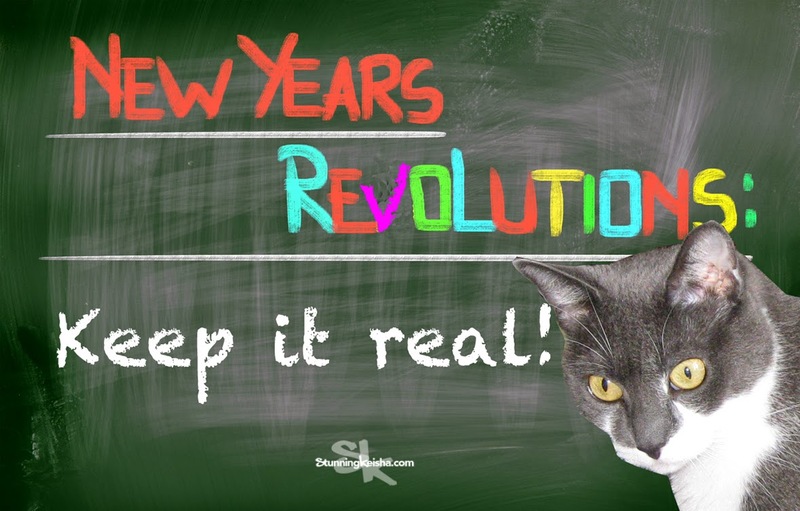 What revolutions would you make for your humans? 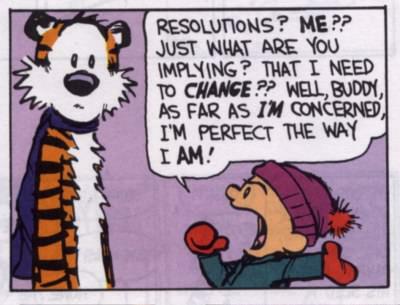 No resolutions here - I know I am perfect! I too am perfect and so revolutionless. I will adopt your list in its entirely--except for the Pop stuff (cause the Human has not provided me with one), I don't care about Chinese food, and the more expensive food is, the less I like it. I guess that leaves me with (most of) 1, 2, 3, 5, 6, 8 and 10. That'll be a good start for the Human I think. Thanks, CK. I'm currently nappin' on Blue Pillow #1. #2 is available.....just sayin'. I could show you a Happy New Year, if you get my drift. There is nothing wrong with being a senior. Pricilla is senior goat and she loves being in charge. WE think #5 is the best one of all! And please don't get us started on our Mommy. She's hopeless. Even though Grayce bites her. A LOT. I just wonder how No # 6 could happen to you, CK ??? Well, see, yea. Our Mumsy is an ongoing project. Mostly, we got her pretty good trained. We just really need to step it up in the posting area. CatDaddy Junior is at work a lot so is mostly a lost cause. We love how you have the names of the foods you want listed out. And we wish you a lot of luck on getting all those revolutions realized. Yup. Of course you're perfect the way you are, CK! We think the drone is a pawesome idea, and we can't wait to see a video of you killing it. We know YOU are purrfect....the humans never seem to be able to reach our level. That is a great list CK, but I do think some enforcement action might be necessary! CK if that works I'm gonna try that next! Those are great revolutions! I agree you are perfect the way you are. My kitties would have similar ones to you except on the CHinese food they would want the boneless spare ribs their Dad gets. And more time with the laser and dabird. That's right! Why mess with purrrrfection???!!!! CK....hay...speeking oh food...whatz on de menu two day at TREZ Keisha....a fine merlot N purrhaps....mackerull !! ?? Those are some mighty good revolutions. We agree with all of them.Good choices. We copied your list. Have a great day. You don't need revolutions! Like you said, you are perfection and I do think I am too. The humans on the other paw leave a lot to be desired. But I kind of think your teeth will get busy! I think all but #4 are attainable. Chinese take out once a week is a lot of Chinese take out. I've never made a resolution, although mom thinks I may have decided to hack up a hairball at least once a month at 4am on their bed. Well I am definitely not perfect! My huskies on the other hand may have something to say about that! Great revolutions for sure...#1 is most excellent! Of course you are purrrrfect CK. I think you have given perfectly acceptable revolutions for TW and Pop. They should be able to handle those - it's minimal!